Between 1928 and 1930, Gus Cannon's Jug Stompers recorded 26 songs for Victor, and there were a couple of duets by Cannon and Hosea Woods; Gus had also recorded half a dozen sides for Paramount, as Banjo Joe, towards the end of 1927. The complete works (34 songs plus one alternative take) used to be available as a Herwin double LP, mastered from the same collections of 78s as the 23 tracks on this CD; they are still obtainable on two Document CDs, the second of which also includes the recordings made under his own name by the Stompers' harmonica player, Noah Lewis. I mention all this because, if there's a criticism to be made, it's that Yazoo and Richard Nevins have not applied their remastering skills to producing a 'complete works' double CD with the same remarkable sound quality as this single disc. That complaint does not detract from the intrinsic merits of The Best of ..., however. 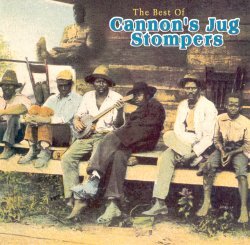 There is not, in my judgment, a finer body of jug band recordings anywhere; the Memphis Jug Band and Clifford Hayes' Louisville aggregations may have recorded more extensively, but Cannon's Jug Stompers are unrivalled for depth of blues feeling and consistency of musicianship. Their repertoire also extends well beyond blues, as might be expected; Gus Cannon was born in 1883, and by the time he heard his first blues, around 1900, he was a fully fledged banjo player, and singer of songs like Old John Booker and Ain't Gonna Rain No More. He was 45 years old by the time he entered a recording studio. It's fitting, therefore, that the CD begins with Feather Bed, whose opening lines are, 'I remember a time, just before the war, Coloured man used to hunt him out chips and straw; But now bless God, old mass' dead, Coloured man plumb fool about a feather bed.' (This is not, needless to say, to be taken as indicating that everything became wonderful for African-Americans after Emancipation.) This sound clip is from that track, and shows immediately the wonderful rhythmic looseness of the band, the drive of Cannon's jug, the rippling onrush of his fingerpicked banjo, and the awesome power and invention of Noah Lewis. Lewis was so loud that he used to sit in with brass bands at country picnics, but he was also among the most subtle, thoughtful and moving of all blues harp players; there's a good case for seeing him as the father of the Tennessee harmonica style that was taken onwards by Hammie Nixon and John Lee 'Sonny Boy' Williamson. The latter it was who defined the aesthetic for blues harmonica to this day: passionate, swinging, with the instrument functioning as a responding and commenting second voice. In that sense, it could be said that much of what blues harmonica players do is ultimately traceable to Noah's approach to his instrument (and, no doubt, to other, unrecorded players who were around at that place and time, but I don't go along with the fashion, in some quarters, for refusing to have musical heroes.) It seems almost unfair that Lewis should also have been a magnificent singer, with a forcefulness and emotional insight that were every bit as assured and unimprovable as his playing. Normally, at this point, I would include a clip from Viola Lee Blues, but Yazoo, working from 78s, have given a grateful reviewer something to carp about, by using the marginally inferior take 2. Here, instead, is Lewis's floating, trance-like delivery of Going To Germany (sound clip), with Cannon's banjo chords in perfect, ringing support. The speaker at the end of that clip was Hosea Woods, a man of about Gus Cannon's age, who became the Stomper's third and final recording guitarist, succeeding Ashley Thompson and Elijah Avery. Gus seems to have got on well with Woods, both personally and musically, and it's no doubt this which accounts for the band's later sessions surprisingly featuring fewer blues and more old-timey songs, like My Money Never Runs Out and Walk Right In which, as Don Kent points out in a perceptive set of notes, 'might have been a cakewalk only a few years earlier.' Woods was a stentorian vocalist, and not my favourite Jug Stompers front man. He also had a penchant for making comments on the band members' performances in the 'Mr Interlocutor' style that was heard briefly on the sound clip. Unfortunately, he does so in an unvaried, mechanical tone of voice, and thereby makes Tired Chicken Blues the band's one positively dislikable recording. I would have replaced that track with Bugle Call Rag, which holds few surprises - it's reveille plus Bucket's Got A Hole In It - but is still pure pleasure to hear. That, it should be clear by now, is also a general judgment, both on Cannon's Jug Stompers and on the present CD. This extract is from Big Railroad Blues, sung by Ashley Thompson, who was dropped after the first session. That's one of the great misfortunes of blues history, for not only was Thompson another of the band's succession of great singers, he was also the only one of its guitarists who went beyond providing rhythmic support, finding scope to cartwheel and sparkle in the context of ensemble playing. (sound clip) In doing so, he seems to push both Cannon and Lewis into even more inspired displays of syncopated bravura. And, of course, there's Gus himself. As well as being a remarkable singer and banjoist (hear his slide version of Poor Boy (not on this CD) for definitive proof of the latter point), as a medicine show veteran, he was also a good comic raconteur. Here, he delivers the punch line of Madison Street Rag, as 'the man with the headache stick' breaks up a street corner party, and the band swings into a final statement of the theme. (sound clip) Researchers who visited Gus in later years sometimes found him 'Uncle Tom-ish', but it's hard to grasp how different the world in which he'd grown up was from the one in which he spent his old age. The Gus Cannon who recorded that song was a middle aged man who had to put up with being addressed as 'boy' by white people, and who knew that it was wise both to avoid 'the man with headache stick', and to describe police brutality in such euphemistic terms. Among Gus's medicine show jokes was, 'They started to raise me in Mississippi, but the rope broke,' and such (literal) gallows humour was one way of dealing with the realities of life in the post-Reconstruction South. Another of Gus's solo pieces, Can You Blame the Colored Man? deals with Booker T Washington's dinner at Teddy Roosevelt's White House in terms that would have satisfied any white supremacist who chose not to look below the surface. There's much irony (Feather Bed), fantasy (My Money Never Runs Out), and dreaming of being elsewhere in the Jug Stompers' music, and there's a lot of unflinching realism (Prison Wall Blues) as well. Above all, though, there's magnificent, celebratory, life-affirming musicianship.